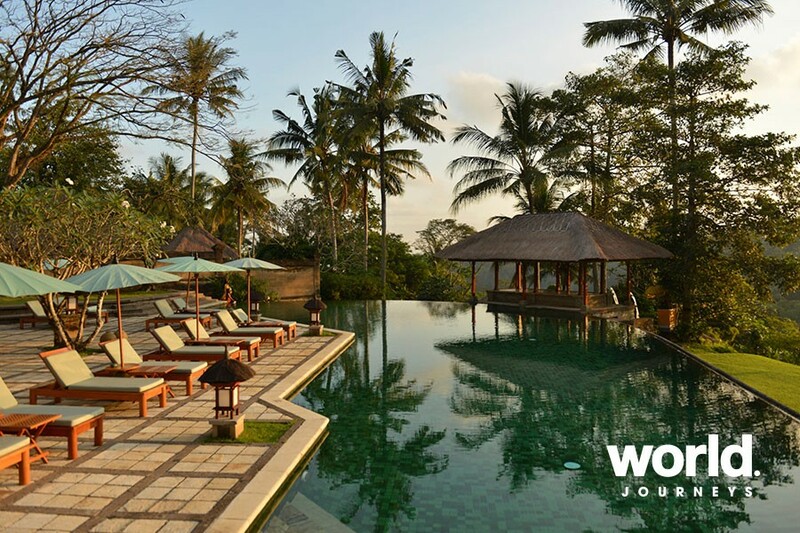 Introducing World Journeys favourite selection of luxury resorts and hotels in Bali. 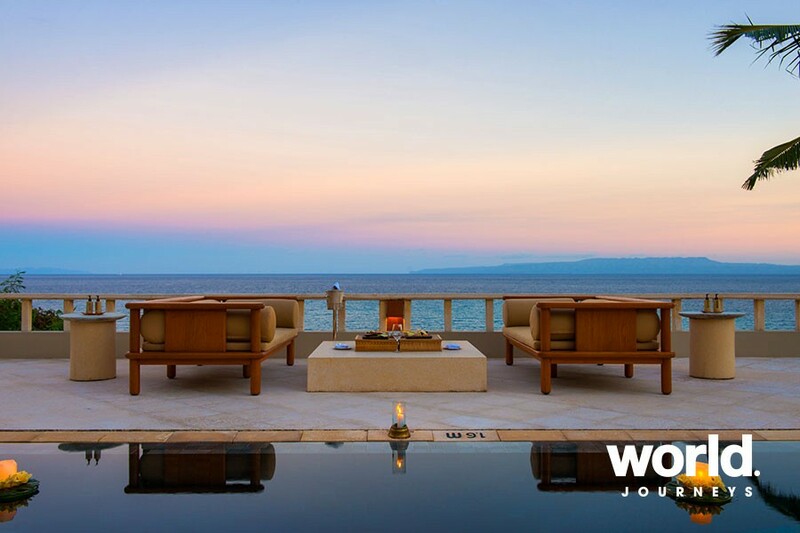 These luxury resorts and hotels offer the ultimate in unparalleled luxury. Choose from the following and relax and unwind in comfort and style. Ubud: Amandari Villas Nearby Bali's arts and culture capital of Ubud high above the Ayung River gorge, Amandari ('peaceful spirits') is a retreat for hiking, biking and cultural excursions. 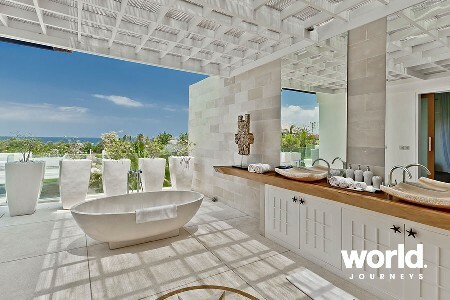 Styled as a walled Balinese village, 30 spacious suites feature a large, outdoor sunken marble bath, marble flooring, three wall-sized sliding glass doors that open onto gardens, and in 11 suites, private pools. The Asmara and Ayung Suites are duplex suites with large private swimming pools and rice terrace and valley views. The Amandari Suite offers one or two detached bedrooms with a separate living room pavilion. The Amandari Villa includes five separate pavilions. Yogyakarta: Amanjiwo Amanjiwo ('peaceful soul') is a monumental, 36-suite resort set in the heartland of Central Java. A haven for exploration of ancient monuments and temples, it is ideal for discovery of Central Java's rich artistic and cultural traditions. With views to the Kedu Plain and four volcanoes on the horizon, Amanjiwo looks to the world's largest Buddhist sanctuary, 8th century Borobudur. Suites are defined by terrazzo flooring, limestone walls and domed roofs, with sliding glass doors that open to a garden terrace with views to Borobudur. Fifteen suites come with private swimming pools. All suites include a private bale with daybed. Karangasem: Amankila Set in East Bali overlooking the vast sweep of Lombok Strait, Amankila ('peaceful hill') is a cliff-side beach resort where 34 suites enjoy sea views and connect by elevated walkways to a three-tiered swimming pool and resort facilities. The Beach Club has sailboats, water sports equipment, a 41 metre lap pool and restaurant, as well as eight private lounging bales set along the beach. Each suite features a large bedroom with wide window views, a canopied king-size bed and writing desk. 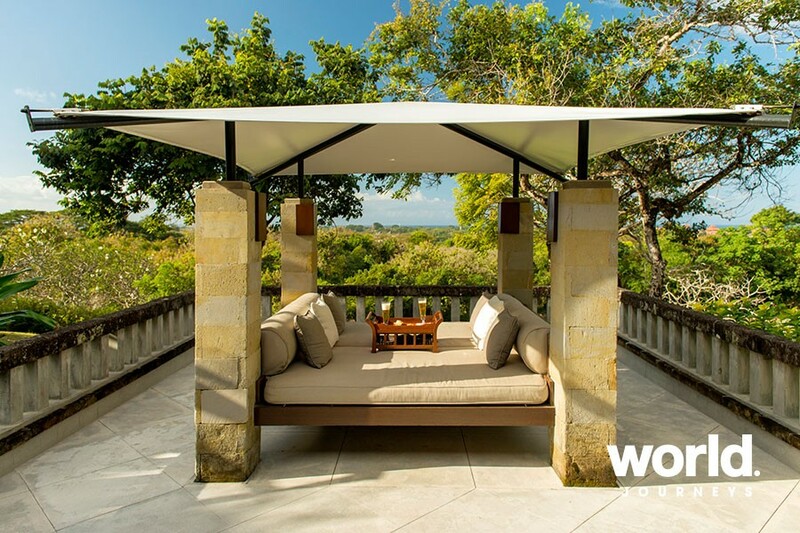 Outdoor terraces are furnished with a daybed, coconut shell table and rattan chairs. Amankila offers nine pool suite options. Sumbawa: Amanwana Overlooking the crystal-clear waters of the Flores Sea, Amanwana ('peaceful forest') offers 20 air-conditioned, hardwood floor luxury tents in ocean-front and jungle settings on the nature reserve of Moyo Island. Ideal for snorkellers, scuba divers and nature lovers, Amanwana's dive operation also provides boats for sports fishing and cruising. Trekking and trips for beachcombing and romantic picnics are among activities. The Dining Room and Bar are located in an open-air pavilion with a soaring 15 metre bamboo roof, Indonesian hardwood flooring and solid coconut support pillars. Fresh fruit facials and black Borneo body scrubs are among Jungle Cove Massage treatments. 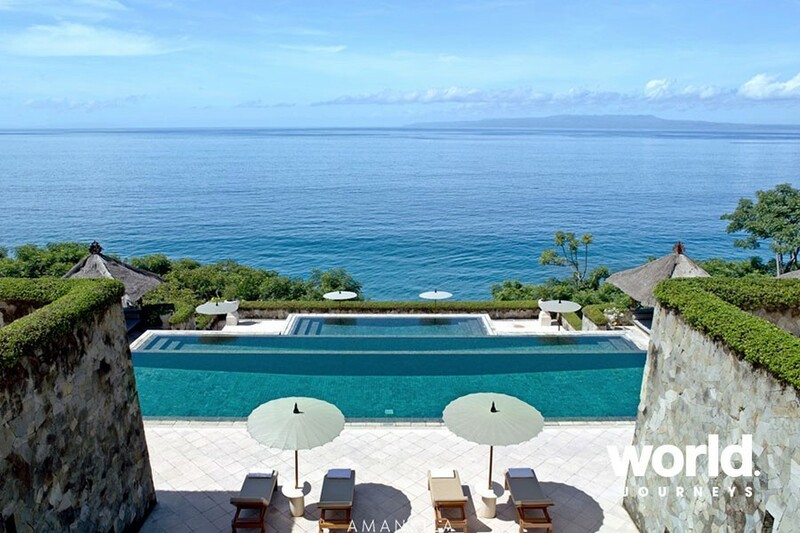 Candidasa: Alila Manggis Explore the wonders of East Bali at Alila Manggis, one of Bali's best kept secrets, Alila Manggis is a secluded, stylish seaside resort in Manggis, East Bali. Set amidst a coconut grove, the resort is nestled between the sea and the majestic Mount Agung, Bali's most sacred mountain. Designed by Kerry Hill Architects, all rooms and suites face the ocean with clear views across the straits to Nusa Penida. 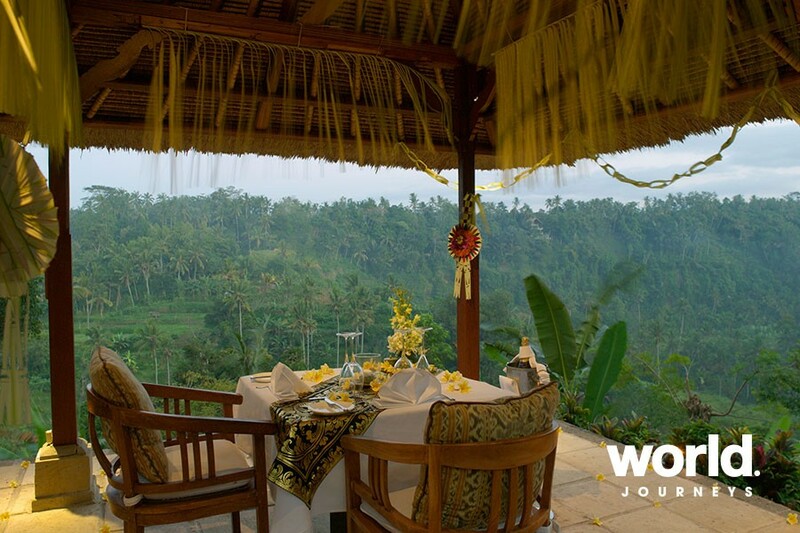 It is famed for its East Balinese Cooking School and dive sites that capture the essence of the destination. 53 rooms and 2 suites • seasalt restaurant • organic garden bale • cooking school • meeting facilities • swimming pool • Spa Alila • Alila Living boutique • diving and snorkeling. Ubud: Alila Ubud Escape to the enchanting hillside retreat of Alila Ubud, an enchanting hillside retreat overlooking the Ayung River, yet located only minutes away from the excitement of Ubud, Bali's artistic cultural centre. Blending contemporary design and traditional Balinese architecture, the secluded courtyards, spacious terraces and private gardens create an intimate feeling like none other. Designed by Kerry Hill Architects, its infinity-edge pool has been ranked as one of the 50 most beautiful pools in the world by Travel and Leisure. 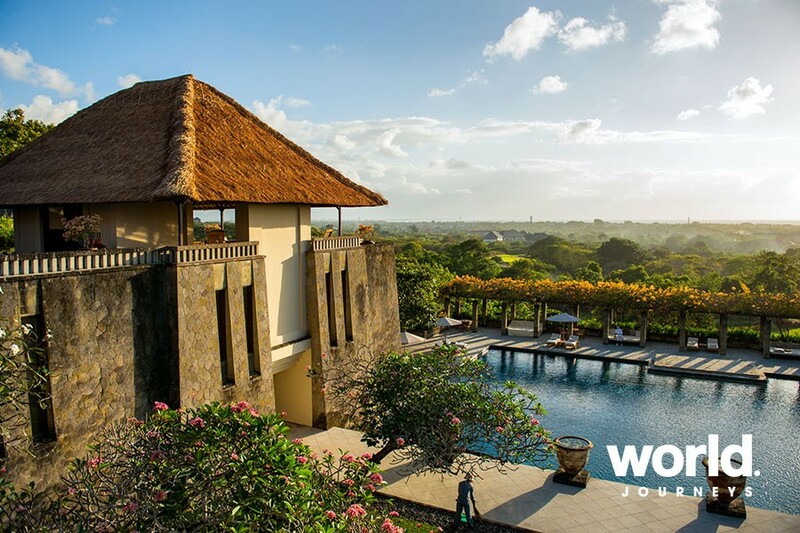 56 rooms and 8 villas • Plantation dining • poolside cabana • Bale Bengong for special dinners • infinity-edge swimming pool • meeting rooms • Spa Alila • Alila Living boutique • fine art galleries • library and TV lounge with high speed internet • sculpture garden. Uluwatu: Alila Villa Uluwatu Enjoy the blissful heights of relaxation at Alila Villas Uluwatu, its spectacular location along the southernmost coast of Bali, Alila Villas Uluwatu offers a rare and unparalleled lifestyle experience. Perched on limestone cliffs one hundred metres above the Indian Ocean, the view is nothing less than picture-perfect - aquamarine ocean vistas and glorious golden sunsets. Here you will find contemporary design seamlessly integrated with the magic of Bali's cultural richness, continuing the Alila tradition of a total destination experience that is sereneï¿½sensualï¿½and surprisingly different. 52 one-bedroom villas with pool • 25 three-bedroom residential villas with pool • 5 cliffside villas with pool • Spa Alila • clifftop sunset cabana • Cire restaurant • The Warung • 50-metre pool • meeting facilities for executive retreats • Alila Living boutique • wedding lawn • fitness centre • library • 24-hours butler service leisure • concierge service. Seminyak: Alila Villas Soori Discover a true tropical beachfront experience at Alila Villas Soori, a blissful paradise setting for beachfront living at its most relaxing, most stylish and luxurious. 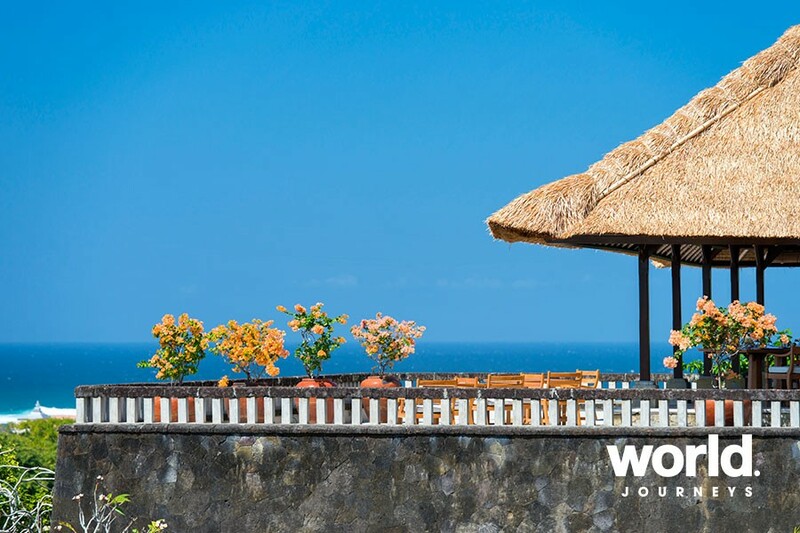 Located along the southwest coast of Bali, not far from the island's famous Tanah Lot Temple, it lies on a gentle slope between verdant rice terraces and beautiful black-sand beaches overlooking the azure Indian Ocean. Embrace the balance of tranquility and vitality that is so characteristic of Bali, and so refreshingly redefined at Alila Villas Soori. 38 one-bedroom villas with pool • 8 three-bedroom residential villas with pool • 1 five-bedroom villa with pool • 1 ten-bedroom villa with pool • Spa Alila • cotta • coast • drift • infinity pool • meeting facilities for executive retreats • Alila Living boutique • wedding lawn • fitness centre • library • 24-hours butler service leisure • concierge service.